It all happened so quickly– I’m still reeling in fact. Suddenly I own compression shorts. I don’t know who I am anymore. 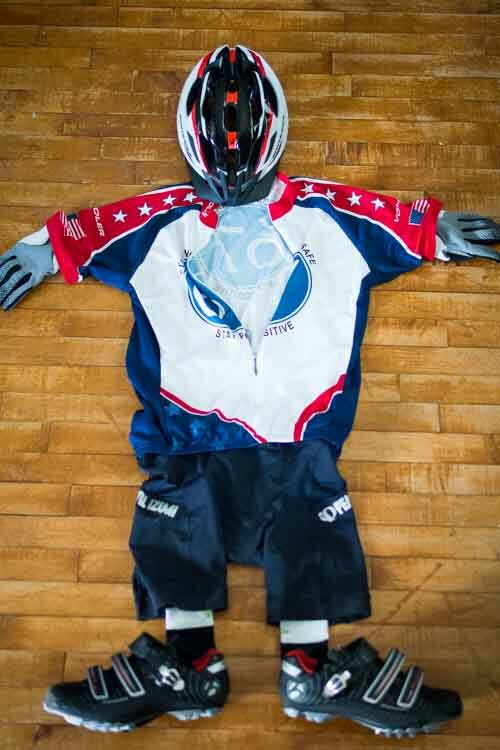 Do you know how much crap I gave my friend in high school for wearing bike shorts? I’ll just say it got a bit brutal at times. The more I write the blog, the more I realize how many apologies I owe. NAH! He deserved it and so do I. Spandex is weird. What could persuade me to purchase so much of a product I’ve long maligned? 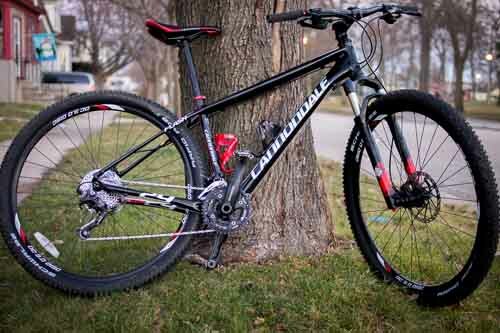 I’ll tell you this much: It’s a Cannondale Trail29ER SL 1 mountain bike. It’s a front suspension, rear hard tail 29er (a current trend toward larger 29” tires from the 26” predecessors). I hadn’t had much time to think these things through you see. I wanted John to help me make up my mind. There was harp music and angels were singing when I walked through the front door of that bike shop. I think I’ve wanted a bike for a long time. I’d just forgotten. I used to love ripping it up on my super heavy mountain bike in high school. It didn’t really survive the experience well. The pedals turn and the wheels spin, but I severely traumatized its psyche I think. It screeches every time I get on it. You might say that it’s a metal-on-metal sound, but I know better; the very soul of that bike is screaming out and pleading for me to put it back to rest. One thing I vowed back then is that my next bike would be a lot nicer (and I’d be a lot nicer to it). There’s just one problem with that pledge: Nice bikes cost money. I didn’t have that money when the soul of my last bike died (college) and since then there’s always been other things to spend money on and I never felt right spending $1,000+ on a toy. Our businesses (yes, there are a couple) did well for us this fall. We are finally starting to pay down our college loans. In the midst of this modest boom my wife turned to me and said, “I feel like God is saying to me that he wants you to have a nice gift.” Yep, we’re Christians and feel like the God of the universe speaks to us. Yes, I know how nuts that sounds. That aside, I’m not gonna lie, I like gifts. I hadn’t thought about buying a bike for years, but suddenly the answer to that question stirred an old desire. I’m glad it was dormant. Buying a bike didn’t make sense till now. If there’s something out there that you want, but can’t have, it’s best not to torture yourself with magazines, websites, and blogs that tell you that you should have what you can’t afford, or at least point out that someone else has it and it isn’t you. So it seems to me that desire should be left alone until it is the time for its fulfillment. I was suddenly given the means and desire for a bike at the moment in which the desire was filled. Just an aside to say that I think it’s okay to want things. BUT if you can’t have it, don’t shop around for the best price. Don’t browse at REI. Go to REI when you know what you want. Don’t go to REI to find out what you want so that you can torture yourself until Christmas… especially a few Christmases from now. Don’t toy with desire. It’s a dangerous thing. When stoked it is an all-consuming fire. Lives have been destroyed in this way. Leave it alone till it becomes a gift that is given. So things are going pretty well for us financially at the moment. We aren’t rich, but for the first time ever things are feeling comfortable. It’d be easy to say that we should have taken the money we spent on my bike and put it toward our student loans, or saved it. We DID do that with most of the money we earned this past month, but this money was meant for me and this gift. It comes back to our faith again. In this specific instance, listening to God was not hoarding the influx of money he gave us thinking it wise to save it for lean months, it was accepting a frivolous, somewhat extravagant gift, trusting that his provision for our needs will continue. It was a curious thing, at the moment I embraced and accepted that the gift was to be a bike, instead of that influx of excitement I expected a barrage of tears met me. I didn’t know why I was crying. Thankfully my wife was there to help me unpack my pain. Real men realize that there is a deep wound inside most of us. Mine came from my dad. I’m guessing yours did too. Growing up I felt guilty asking for anything because I believed we were dirt poor. The few times I asked for something nice, instead of a calm explanation I experienced a fight between my mother (who wanted to give me what I wanted) and my father (who was very fiscally conservative). When you’re the source of fights like these over the simplest of requests, you quickly learn to not ask for anything and get by with what you’ve got, feeling guilty that you even have that. In short I realized that from the time of my childhood I’ve felt guilty I even exist and believe that I’m a burden to those around me. This post has gone a bit deeper than a bicycle, no? All of the self-discovery, the pain, the joy has confirmed in me that God had meant for me to have this gift, in part because he loves to give good gifts (spiritual and physical), but also to bring about my healing. I’ll have lots of time for therapy in the saddle. I love the woods. I feel like God is there, hugging in tight with the trees. I felt it when I went riding the other day for the first time. I tried calling friends to ride with me. I suspected that no one would be able to go and I was right. It was just me and God and the bike he gave me. It was rapturous, or exuberant, but it was RIGHT. I was relearning love. I’ve found that’s often done best in solitude. Not always, but often. I bought a bike that very day. I bought the very first and only bike I test rode. I didn’t look at a single other bike. I knew it was the bike. They were walking over to put the huge markdown tag on it when I walked in the door. I sensed (in my crazy, I think… ahem… know that God informs my decisions, kind of way) that I need look no further. Usually I research my decisions thoroughly, especially one of this magnitude, but this was my Christmas present from God. My favorite presents have always been the ones that are well thought out by the giver and totally unexpected. I walked into that store and knew right away that I could trust John and his 30 years of experience. God gave me the gift of a bike. God gave John (the owner of Fond du Lac Cyclery) the gift of using his knowledge and passion to outfit someone with their ideal bike. We were both excited and blessed by the experience. You could say it was just the dollar signs in his head, but I don’t think so. I saw something more there. I think he did too. John understood what that bike meant. Is this the end of real men show leg?? This is what it would look like if a mole rode a mountain bike. So excited for you Brandon. In so many ways. I almost cried reading this. Great story!